Nice trilby hat... But what's in that violin case?! ... so do you want to know what's keeping those 'in-the-know' folks talking about Braehead Arena? It's... the scale of the events that take place at Braehead Arena. Where else in Glasgow might you find the gorgeous Beyonce appearing the same week as professional international wrestlers? Wow! Enjoy! Now... don't tell anyone else. And DO NOT reveal this Braehead Arena top secret file and password. We'll know.... And we'll track you down and sneak little sticky "tickle me!" labels onto your back! And get yourself onto the VIP list below while it's still open, and I'll drop you a short email every time we reveal something new about Braehead Arena. And remember you can grab your own page here to share your tips, photos and stories about Braehead Arena. Have fun! Great news! 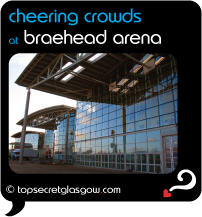 Finding this page means you can now join our VIP list for Braehead Arena. You found the Top Secret File for Braehead Arena. If you don't have a password yet, there are still lots of great things about Braehead Arena in its Buzz Page. ("The Buzz" page is also the place to pick-up the password by taking part).